I've got about $80 in my CPU fund and just put it on the front burner. Looks like next month. 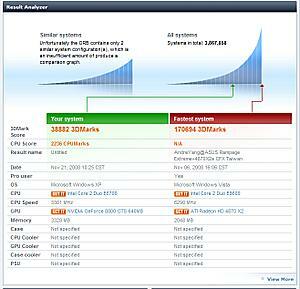 So I need a replacement for the E4300 and I have vary little knowledge of the good ones or bad. I'll have $150 -$160 to spend and I need some help figuring which one would be best-or even wait some more and build the fund for a better CPU. P.S. I heard ya bonesaw, will take a look. I've asked that same question myself and I couldn't come up with an answer that I could even justify to my self. That was on the list at about this time in the schedule and so I started to look for that upgrade--but I don't need it. The only two things I put the CPU to work at is folding and multimedia stuff. The E4300 handles that stuff with ease. A PC Power & Cooling 610, or a Corsair 650 watt will handle everything but a high end SLI or Crossfire setup with ease. Both are near silent, efficient, reliable and have a single high amp 12v rail so load balancing is not a factor. The PCP&C 610 is about 1/2" longer than most PSU's, which can be a problem in some cases, but should fit in your full tower without issues. If a high end dual graphics card setup is in the cards down the road I would step up to the Corsair 750 watt. Last edited by ccperf721p; 20th November, 2008 at 08:01 AM. The PCP&C 610 is about 1/2" longer than most PSU's, which can be a problem in some cases, but should fit in your full tower without issues. Well, my suggestion for a CPU would be the Intel Core 2 Duo E8400 Wolfdale 3.0GHz 6MB L2 Cache LGA 775 65W Dual-Core Processor. 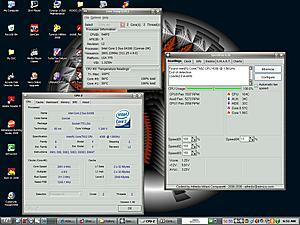 This at stock speeds is what you are OCing the E4300 at now. Last edited by MUff1N; 20th November, 2008 at 03:02 PM. The Corsair 750 is on sale at the Egg-attractive price. Thay're usually out of my price range but most are on sale at the Egg untill the end of th month. Craigs list and I are going to have to pick up the pace a bit! Mu appologies MUff!n. I did a little realistic thinking instead of testicle thinking! I don't need a new CPU, that's midlife crisis stuff, I need a better PSU and a good pair of 2g DDR2 PC2-1600 kit befor CPU. I've made a few changes-I have not done any testing yet, I'll start that soon. Folding doesn't seem to bother it and I think I can lower the volts just a little. Last edited by PorPorMe; 20th November, 2008 at 03:53 PM. I see you updated to Speedfan 4.36 & now it sees your fans! They are always updating this so that it will support more sensors, mobos & CPU's. I also noticed with CPU-Z that it now shows your vcore in real time readings instead of the VID. I like being able to see my current vcore is as I already know what the VID is for my CPU! Last edited by MUff1N; 20th November, 2008 at 10:12 PM. New 9600GT 1GB video card showed up about an hour ago-CPU is at 2.8G-upped the shadders to 1725-nothing else has been done-time to download 3Dmark 6 and take a look. 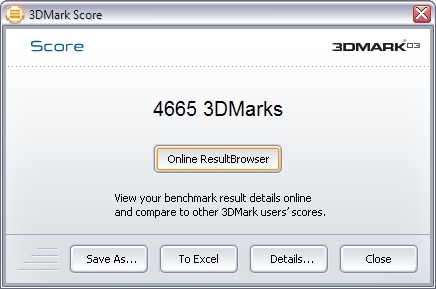 3DMark06 was a pain. you couldn't stay in the program, you had to go online and then it was still a pain. For reference, score was 9992. Congrats!, 10k is a good score. We know you are going to do better thou. Damn, I must have forgot to hit send! That was last nite. The point was it's time to slow down-do some clean up stuff, get my GPU client installed, and then start with the OC as time will allow. In a few days a Pentium D 926 Prescott will arrive and I have another rig to put together for folding-if the motherboard is any good. I got it in trades for almost no out of pocket money so what the heck, not everyone's dishonest,right? Maybe even those that sell or trade $300 Gigabyte motherboards for a $40 trade. Everyones not dishonest, are they? I expect to be looking for a low rent board next month. This month with complete lack of judgment and common sense-I bought more computer stuff than I should, New cooler. Two items back for RMA-both of them twice. $80. A few related purchases that are nothing the budget had any room for, What am I talking about? Budget, Smudget they don't exist once the Pore Foke start spending! Like a two for one sale at Axel's Pawn shop on tools. so now I am the proud owner of a Craftsman scroll saw and a Craftsman jig saw for $15. To make a long story short-there ain't to many recopies for making and serving up a good cat. If anyone knows a good gravy-i think she is going to be a bit tough-let me know! Not bad scores there PPM! 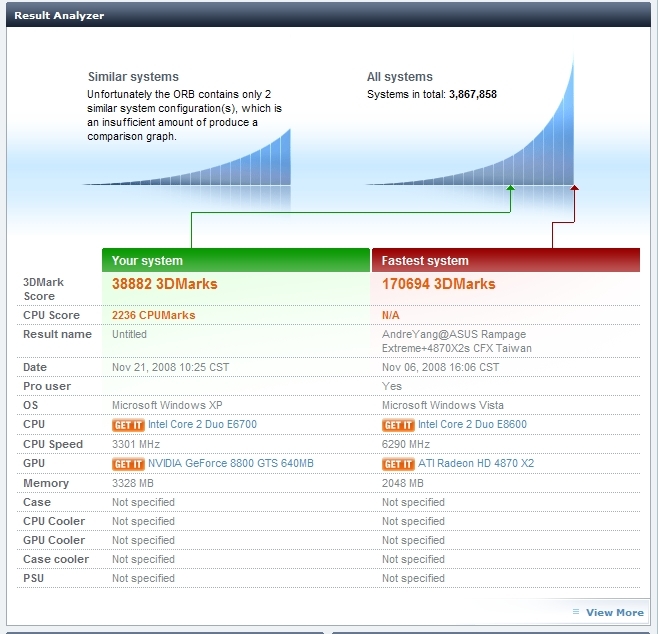 I just wanted to see what mine was since I hadn't run that 03 test since I first got my system & ran it at stock which was almost the same as what you posted. This is what it is now...a bit better. This old 8800GTS does pretty good. I think it's because it's 320bit interface instead of 256. Just our of curiosity I decided to run a second test with all the graphics settings set to KILL instead of default to see how my system & card stood up. 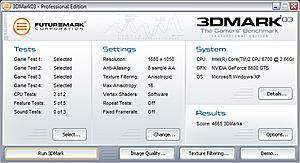 This test set like this pushed my graphics card beyond what it could do. Sometimes the framerates fell to 6 fps. Last edited by MUff1N; 21st November, 2008 at 06:13 PM. Those are nice! I been spending the whole afternoon thinking I could give you a big surprise by either hitting real close or even better. Traded for an EVGA 9800GT with th .45 core but things haven't gone smoothly. 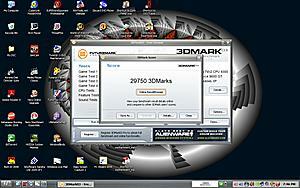 3DMark03 dropped to 13000 and 3Dmark06 would crash every time. I've been woking on it. Not JUST because of thar problem, but I'm getting to the point of doing a clean install. My last regestry check showed over 700 errores and I'm starting to do more repair than having fun! I want to learn how to run these two together-just to see what they do. If thats possible. Hmm, looks to me like this is OS driver errors & conflicts & not HW system problems to me. Anyways, I just looked and notice that Nvidia has updated their Forceware drivers again. Now at v180.48. I'll have to download & install these & see what happens. 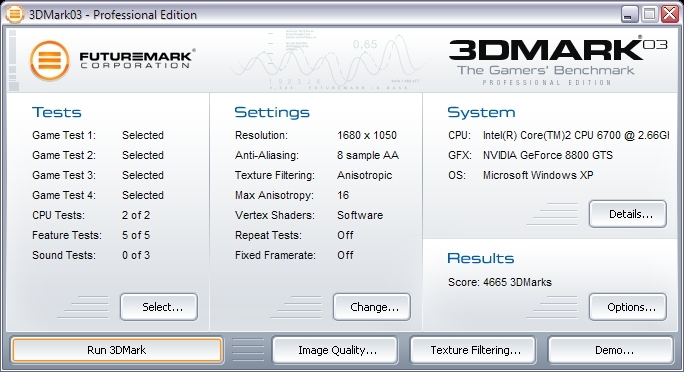 But lately the newer drivers are giving better performance & 3DMark scores & according to this one, its a 10% improvement...I'll check that out. Last edited by MUff1N; 24th November, 2008 at 04:09 PM. Ok-I'm back with the min installed. I installed the 180.48 drivers with the 9800GT, what I think thursday? we will see what happens now.The Atitool crashed when I tried to save settings. It was all a train wreck. And this is my first clean install with a IDE controller and I thought I'd screwed up my formats because 3 drives were missing! 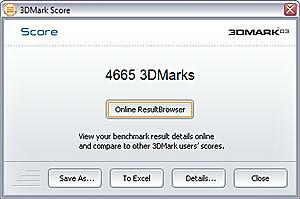 I'm going to try 3DMark06 and be see what happens now. Strongwolf has got me worried though, did anybody catch his last msg? Would someone asK him what he was trying to say cause I MISSED IT! I wish to declare to the world that success has been acheeved. I didn't have screencapture installed so no pics but 3DMark06 ran all the way thru on the 180.48 drivers stock score of 11076! Now i can put my rig back together-back it up this time-and then start to OC for real-finialy! Opps-I forgot another project starting next week some time. OH, Well I'll get there.